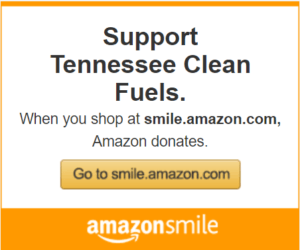 Example fleets that use CNG or LNG TN: UPS, Dollywood, Scott Appalachian Industries, Waste Management, cities of Gatlinburg and Sevierville, Flatrock Concrete, and numerous gas utility districts across the state like MLGW, Piedmont NG, Gibson County Utility District, Athens Utilities Board (AUB) and Knoxville Utilities Board (KUB). What do the acronyms mean – CNG, LNG, RNG? CNG is compressed natural gas, LNG is liquified NG and RNG is renewable natural gas (or CNG made from renewable sources like landfill gas or biomethane from digester operations). How many CNG stations are there in Tennessee? As of spring 2019, there were 13 public CNG stations in Tennessee open with numerous other fleets using CNG but with private refueling equipment, and another public CNG station expected to open this year. 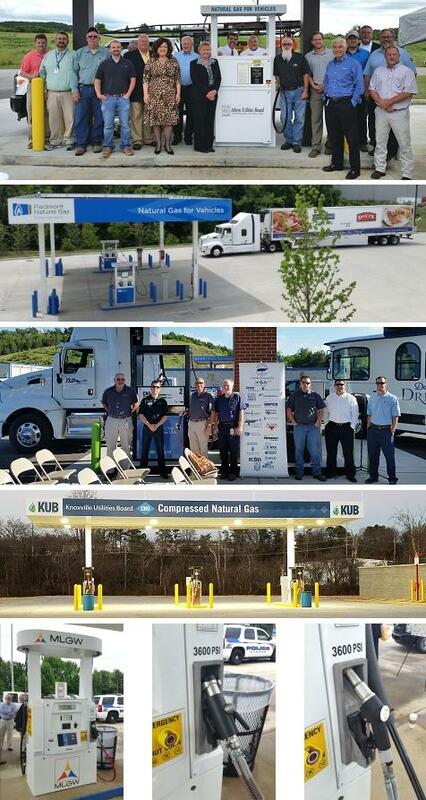 KUB in Knoxville is the most recent station to open and is Knoxville’s first public CNG station (and is just off of I-640 on 3rd Creek Road)! Natural gas, a domestically produced gaseous fuel, is readily available through our country’s utility infrastructure. Whether produced via conventional or renewable methods, this clean-burning alternative fuel must be compressed or liquefied for use in vehicles. The United States has a widespread natural gas pipeline system, which quickly and economically distributes natural gas across the lower 48 states. Gas is distributed using 300,000 miles of transmission pipelines (see map below), while an additional 1.9 million miles of distribution pipes transport gas within utility service areas. CNG is produced by compressing natural gas to less than 1% of its volume at standard atmospheric pressure. To provide adequate driving range, CNG is stored onboard a vehicle in a compressed gaseous state within cylinders at a pressure of 3,000 to 3,600 pounds per square inch. Liquefied natural gas, or LNG, is natural gas in its liquid form. LNG is produced by purifying natural gas and super-cooling it to -260°F to turn it into a liquid. During the process known as liquefaction, natural gas is cooled below its boiling point, removing most of the compounds found in the fuel. Renewable natural gas (RNG), also known as biomethane, is produced from organic materials—such as waste from landfills and livestock—through anaerobic digestion. RNG qualifies as an advanced biofuel under the Renewable Fuel Standard. Because RNG is chemically identical to fossil-derived conventional natural gas, it can use the existing natural gas distribution system and must be compressed or liquefied for use in vehicles. Natural gas powers about 150,000 vehicles in the United States and roughly 15.2 million vehicles worldwide. Natural gas vehicles (NGVs) can run on compressed natural gas (CNG) or liquified natural gas (LNG). CNG is the most widely used option (as well as the most widely used alternative fuel) and is a good choices for high-mileage, centrally fueled fleets that operate within a city or regional area. For vehicles needing to travel very long distances, liquefied natural gas (LNG) enables the vehicles to go longer distances on natural gas. The advantages of natural gas as a transportation fuel include its domestic availability, low cost, growing infrastructure and inherently cleaner-burning qualities. Dedicated: These vehicles are designed to run only on natural gas and are spark-ignited (SI) engines. Bi-fuel: These vehicles have two separate fueling systems that enable them to run on either natural gas or gasoline, not both. The engines are almost always SI, and use a spark plug to provide the ignition point. Dual-fuel: These vehicles are traditionally limited to heavy-duty applications, and have fuel systems that run on natural gas and diesel at the same time. They are compression-ignition (CI) engines and use diesel as the “spark” for ignition, and typically burn on the order of 50% natural gas and 50% diesel. For light- and medium-duty fleets, although there are a few OEM CNG vehicles on the market, most vehicles are conventional vehicles that are converted to run on natural gas. As you move into the heavy-duty market and the largest on-road vehicles used in the U.S. (think class-8 tractors, dump trucks, school buses), you find many more OEM products that are purchased directly from the vehicle manufacturers. Compared with vehicles fueled by conventional diesel and gasoline, natural gas vehicles can produce lower levels of some emissions. And because CNG fuel systems are completely sealed, CNG vehicles produce no evaporative emissions. Natural gas is increasingly used to replace gasoline in smaller applications, such as in forklifts and commercial lawn equipment. Because natural gas is a low-carbon, clean-burning fuel, a switch to natural gas in these applications can result in substantial reductions of hydrocarbon, carbon monoxide, oxides of nitrogen, and greenhouse gas emissions. What are the emissions reductions gained from natural gas? Light-duty vehicles running on compressed natural gas (CNG) and liquefied natural gas (LNG) emit approximately 6%-11% lower levels of greenhouse gases than gasoline powered vehicles throughout the fuel life cycle. Find out how Waste Management powers refuse vehicles with renewable natural gas from the Altamont Landfill in California. The Natural Gas section on the AFDC Website – Great starting point in learning about natural gas opportunities and technologies. NGVAmerica is the national trade association dedicated to the development of a growing and sustainable market for vehicles powered by natural gas or biomethane. www.CNGprices.com is the only website where you can a map of all the CNG stations in the USA that INCLUDES pricing information for almost every station.